Vinnfier Champ 808 BTRM comes in a big packaging box. Can’t even take the whole picture on my ‘photo studio’ desk as you can see. Well-protected with foam board by the way. 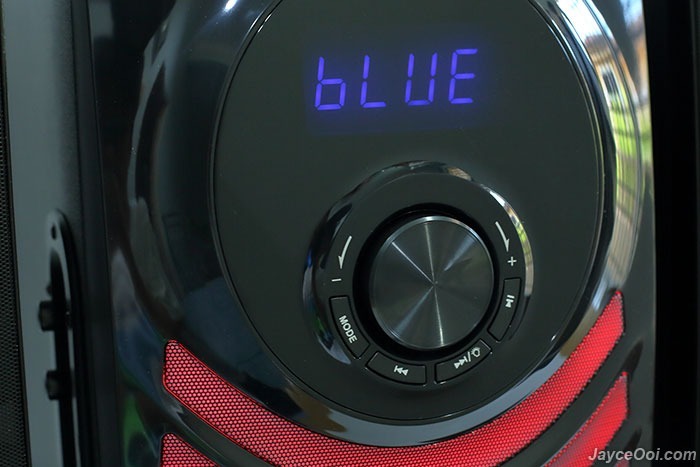 Once taken out the speakers, you can find 3.5mm AUX audio cable, FM radio antenna, multi-function remote controller and user manual. 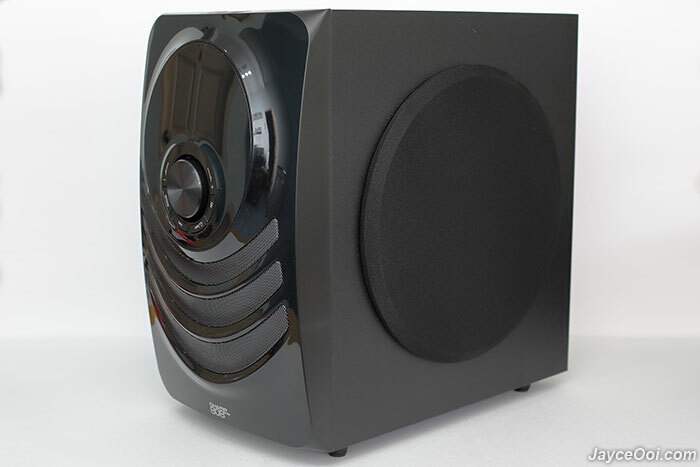 Yup, it is a big subwoofer. And heavy too. The 8″ bass driver with fabric grill cover is located on the right while bass reflex port at back. 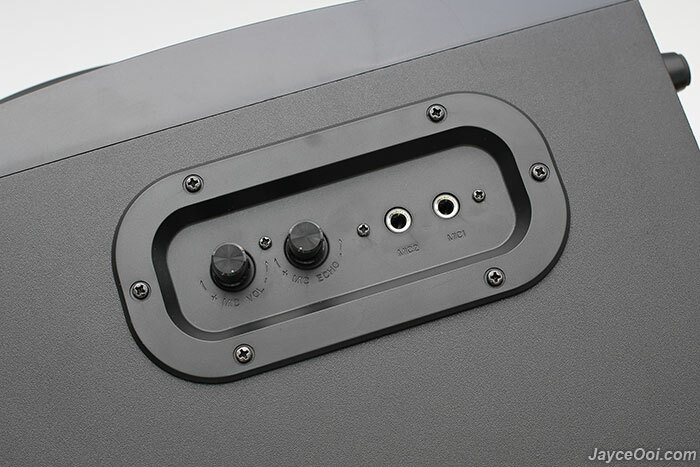 Note – there is a cover inside the bass reflex port to prevent insects from going in. Nice touch. As usual, all the media playback controls are located in front. Same apply to large LED display. There is a bass volume control at back. 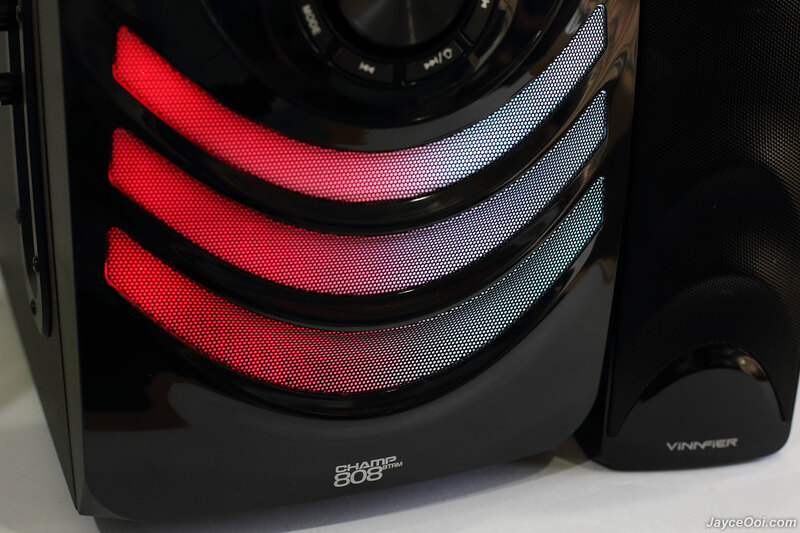 No treble control as that control the bass amount of the subwoofer itself. Put it on 0% will turn off the subwoofer totally. And do check out the large sound volume control at front too. Don’t forget the colourful LED light effects. Finally, 2 tall long satellite speakers that loaded with 2 x 3″ drivers each. But why no tweeter? 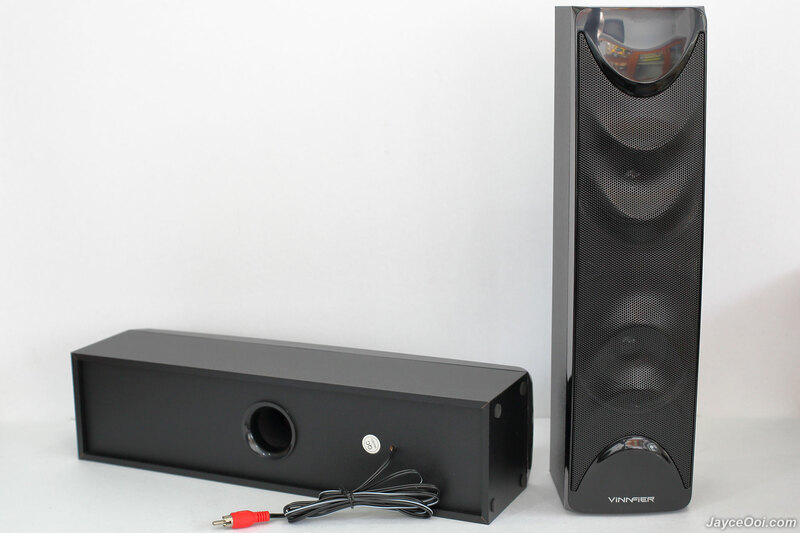 Need a super powerful 2.1 speaker system? 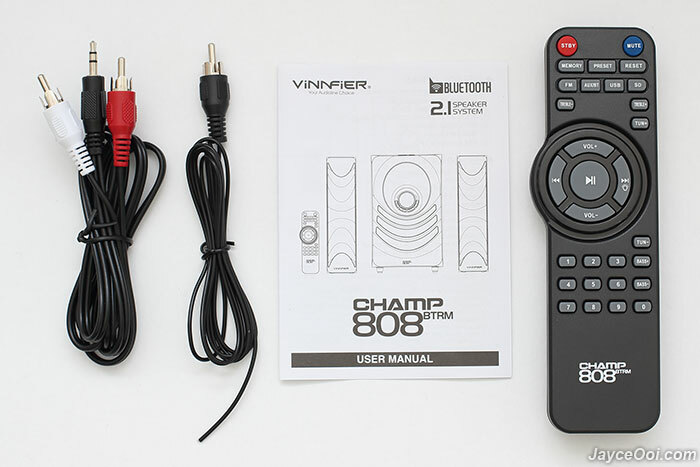 Be sure to check out Vinnfier Champ 808 BTRM. 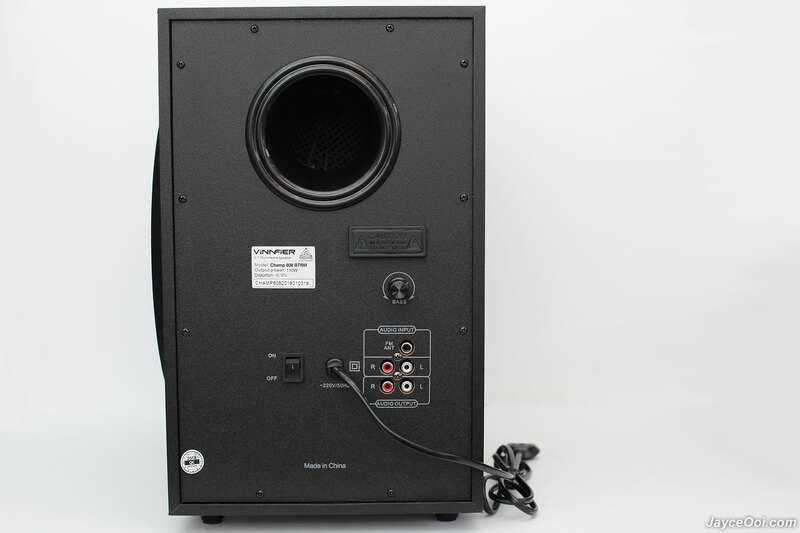 Total power 110W RMS is more than enough to blast in a large living with party going on. Yes, until your neighbours will knock on your door and complaint. That’s kind of loudness. Rest assure that watching movie will be full of excitement just like experience in cinema. Enjoy powerful and pumping bass in those action scenes. Let’s talk about Bluetooth range now. Again Champ 808 passed 10m straight sight line test with ease. And manages to get connected up to 8m+ with obstacles like wall. Outstanding result no doubt. And great for movie and games on mobile devices too as it has almost no lag between video and audio. Besides Bluetooth, MP3 player is here for you and me. Just plug in SD or flash drive with songs will do. It will start playing or continue to playback the period that stopped previously. Yup, enjoy your favourite music all day long. Karaoke is nice add-on for those who love to sing. As you can see, there are mic volume and echo controls. And 2 mic inputs. Just plug in your microphone and enjoy the party with your friend and family. By the way, don’t forget the FM radio too. Signal is clear thanks to adjustable external antenna. Of course, this is depended on your area FM coverage too. And the useful remote control that great for living room. Yes, you can control Champ 808 from far away (at least 7m) with it. 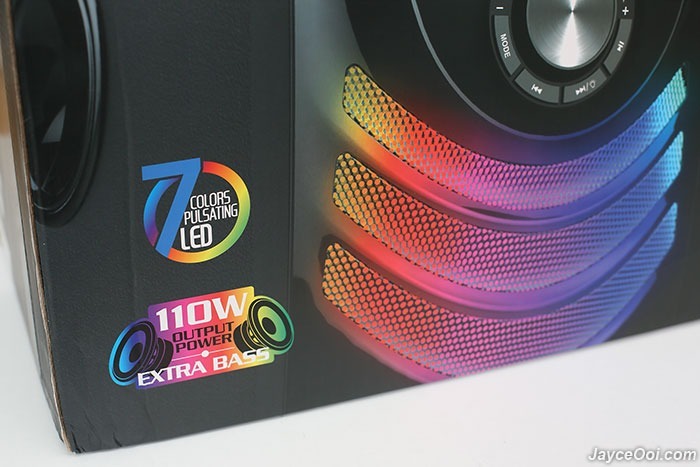 Colourful 7 colours pulsating LED! Yes, it’s nice and attractive for sure. There is animation too like flow from right to left or from center. And will level up your gaming experience with those LED animation effects. If you don’t like it, just turn it off will do. Well, it is kinda expected that Vinnfier Champ 808 BTRM will have toward warm sound signature since there is a large subwoofer there. Yup, it surely is. Thanks to treble and bass volume controls in the system, you can change sound signature to suit your preferences. There is no hardware control so you need to use remote control to do so. Personally, I put +7 for treble and 0 for bass. And middle bass volume on subwoofer. Hmm… There is not sparkling treble that I prefer. 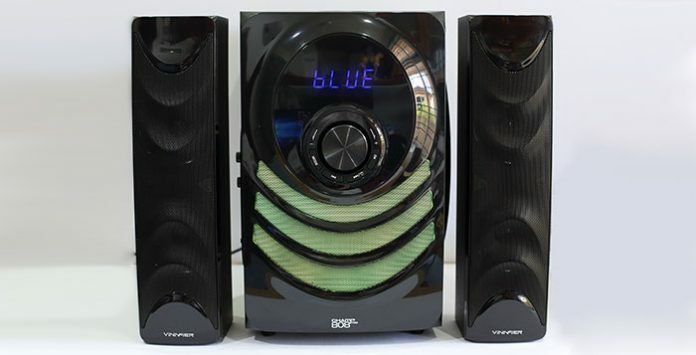 Why there is no tweeter on the satellite speakers? Therefore, highs are soft and smooth. No bright treble for sure. Mids are decent with warm vocal. Natural voices from both female and male. Bass is the star! Yes, ultra powerful bass that can shake your whole house (depend on your bass volume setting of course). Bass head will surely love it. Great for action movie too. You can personally feel the shock wave effect toward you. Deep and powerful bass. Period. 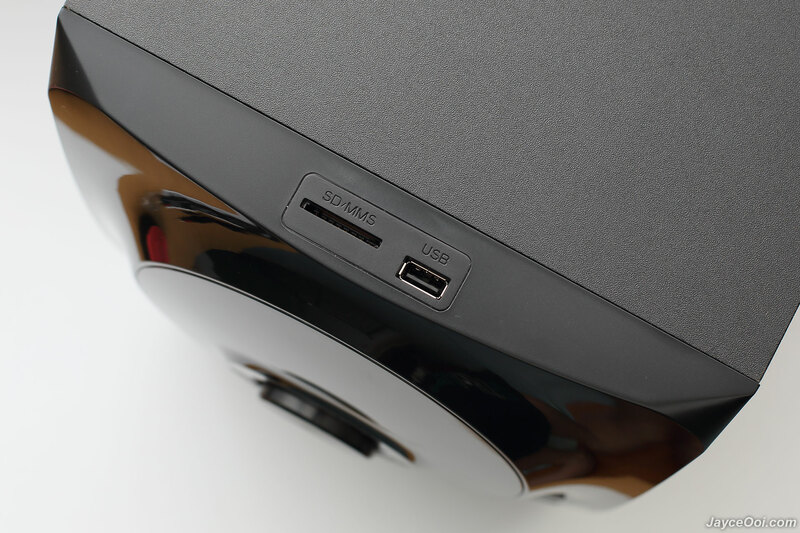 Things to take note… All the settings are gone when power off (FM channels are still there). Yes, Champ 808 can’t remember the last used audio source. And even the treble and bass volume settings. Luckily, all of these can be solved. Just put it in standby will do instead of turn it off totally. Bass head and love booming bass? 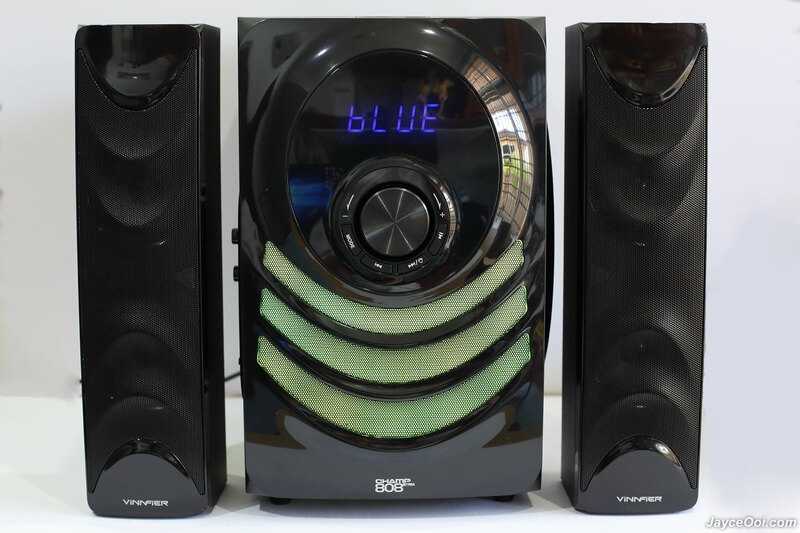 Do check out Vinnfier Champ 808 BTRM 2.1 speaker system with deep and powerful subwoofer. And enjoy party and karaoke all day long. Interested? More information can be found at Vinnfier Website. Get yours at Lazada.